This year, I am riding my 24rd PMC in remembrance of all who have both fought the cancer battle and won and especially those that lost. 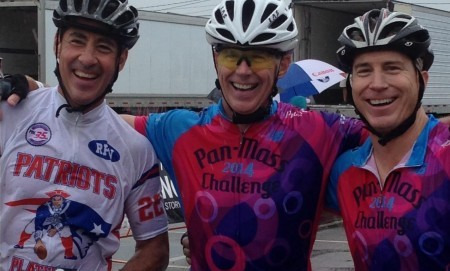 I am also in awe of the cancer fighters and survivors that I meet every year while riding the PMC. We will all face cancer either directly or indirectly in our lives. Let's try to change the outcome in our favor. I know all of us get many worthy requests for donations to a cause. You may have a different, and very worthy cause that you support and I respect. I would only ask you donate something to show your support for my dedication and to help win the war on cancer. Any amount, no matter the size, helps! This year I am riding with my son Kevin (2nd year! ), my brother Bryce (25 years! ), and numerous other friends all working to end cancer. Please make a donation to this years ride. Every dollar helps.